Last year I posted a photo of an immature green seed pod on one of our Royal Poinciana trees. The immature seed pods are green and soft, but as they ripen, they become brown and hard. 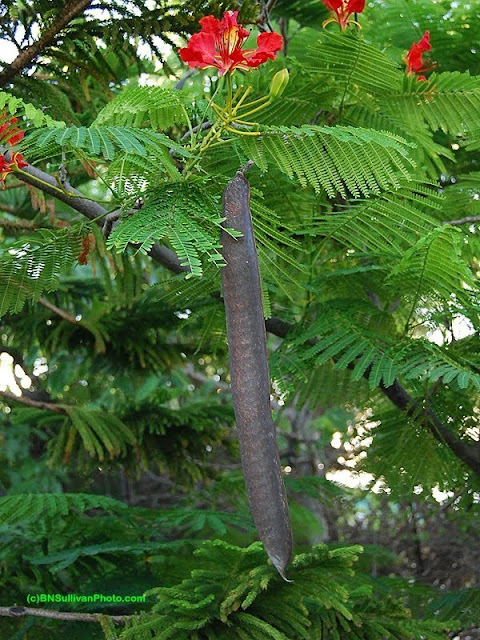 Today's photo shows a mature Royal Poinciana seed pod. Eventually the pods will drop from the trees onto the ground, unless they are removed ahead of time. If you pick up and shake one of these mature seed pods, you will hear the seeds inside rattle against the hard shell of the pod. The seed pods are are between 12 and 18 inches long (about 30 to 45 cm). Seed pods like this are characteristic of trees in this family (Fabaceae). This tree is very attractive Bobbie. I love the flowers too. What a beautiful contrast between the red and green. Thanks, Becky. We always say we wish this tree bloomed around Christmas. It sure would make a pretty wreath. The flowers are gorgeous. Too bad the climate in Canada is cold, otherwise I would want a tree in my yard.